As long as an individual has earnings, he or she can open a Roth IRA and invest up to $5500 per year (or their total gross income, whichever is less). It does not matter where the money being invested comes from. 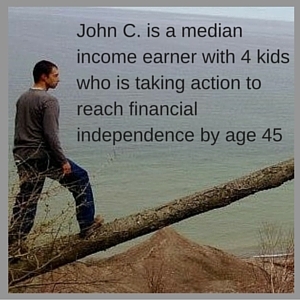 Some parents do a matching system where they will match $1 for $1, just like a company 401K, to any retirement contributions made by the child, others who are in the financial position to do so will fully fund a Roth for their children, and most will simply encourage, or require their children to invest the money from their earnings. Any way that it is done, starting retirement savings at an early age makes an extraordinary difference in how much money will be saved by retirement age. Of course, it is difficult to prioritize for retirement savings at age 15, 16, 17, because there are many expenses that take precedent. Buying a first car, Saving for college, Saving for a home… etc. Of course saving for retirement is also difficult in your 20’s 30’s and 40’s, as there are new expenses all the time, most notably children and household development. Even saving $2,000 a year makes a major difference in the math when started in the teen years. Waiting until it is “easy” will result in waiting until it is too late. Beyond just the value of compounded interest gained by starting investing early, the true benefit isn’t the money saved, its the education received. It’s one thing for a kid to hear about investing for retirement, but that usually goes in one ear and out the other. Taking action and doing it teaches a more enduring lesson. Getting your child disciplined to save money from the start of his or her working life develops those savings muscles and they will be more likely to save once out of the nest because that is the norm. Children learn more through osmosis than from direct teaching. It’s what we do every day, our actions, our behaviors, that will be remembered, not what we said in a lecture at the dinner table one night. If Drake invests $2,000 per year in a Roth IRA starting at age 16, with 8% annualized returns, at Age 65 he will have $1.15 million. 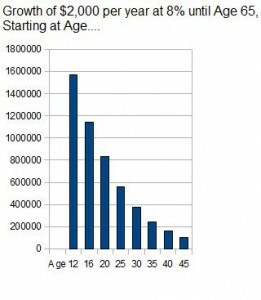 If he waits to start until age 20, it will only be $835,000. At age 30 only $372,000. What if he invested the max of $5500 a year? Starting at age 16, $3.15 million, Age 20, $2.3 million, Age 30, $1 million. Another way to look at the math is to see how much would need to be saved every month to have a $1 million balance at age 65. Of course this example shows the bare bones of what the extra months to save does and what compounding does. In a real world situation, a teenager might save $2,000 a year, but increase this amount to $5,000 a year in his 20s and 30s, and $10,000 a year in his 40s and 50s. Starting small at age 12 or 16, or 20 can set the stage for having $2 million, $5 million, or $10 million or more in retirement. Now does a child have to have a real job in order to do this? The answer is no, Only taxable income is required. (And most likely the child will owe no tax anyways). Let’s say junior mows lawns for neighbors in the summer and earns $2,000. Have him file a tax return, the $2,000 is business income, and he can open an IRA with that. While a normal job makes the accounting easier, it isn’t the only way. Doing legitimate work for a parents business is also valid, however pay for normal household chores is not. While I use Age 16 as an example because it is difficult to find normal jobs at younger ages, it is not unreasonable for a 12 year old to start a yard work or babysitting business and earn a couple grand a year. Adding these extra years makes a tremendous difference in the numbers. Save early, save often, and save a lot. Instilling in children that work = money, and the importance of saving will set them up for an excellent life. Our society too often casts adult children off into the world having no idea how to prepare for the future. Most brokerage firms will set up whats called a “Custodian IRA” for a teenage worker. A parent/legal guardian also has to be listed on the account, but ownership is retained by the child, At age 18 this goes away and it becomes a normal IRA account. Signing up is the exact same process as for an adult, At Vanguard.com the very first step asks if the account is for a minor, and you’re well on your way. Check out the book The Kid’s ROTH IRA Handbook: Securing Tax-Free Wealth From a Child’s First Paycheck or Money Answers for Employed Children, Their Parents, the Self-Employed and Entrepreneurs for more information on setting up an IRA for a teenager.